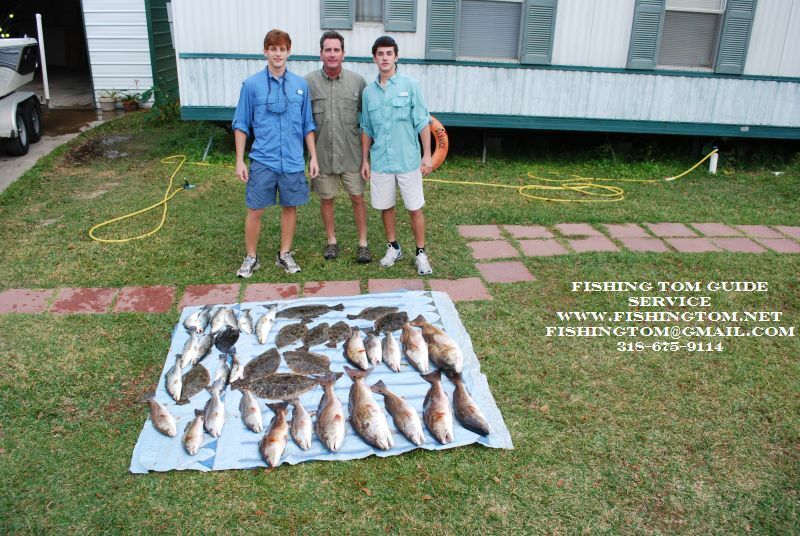 November 29, 2010 Steve S, & Sons Aron and Evan Load the boat!!! November 29, 2010 Steve S, & Sons Aron and Evan Load the boat!!! Live Bait season is over but these guys used Berkley Gulp Swimming Mullet to fill the cooler to the top! November 23, 2010 Shawn & Thomas and Friend Alex Have a great day with their Grandpa (Captain Tom) on Big Lake!!! November 23, 2010 Shawn & Thomas and Friend Alex Have a great day with their Grandpa (Captain Tom) on Big Lake!!! Alex had two 5# Reds and several trout and said it was the best day of his young life. Thomas and Shawn caught several nice fish on live shrimp but it was just another fun day on Lake Calcasieu with their Grandpa for them! 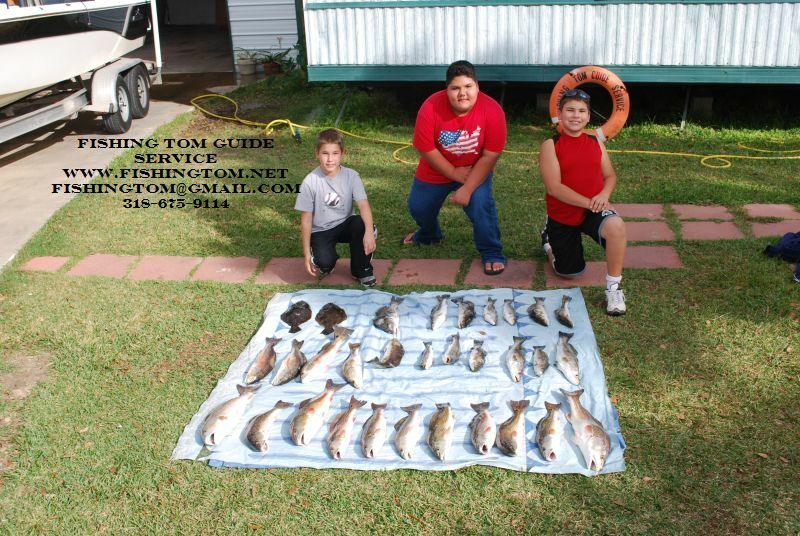 November 22, 2010 Anthony S. & Sons Christian & Conner Find the Big Bruisers on Lake Calcasieu!!!! 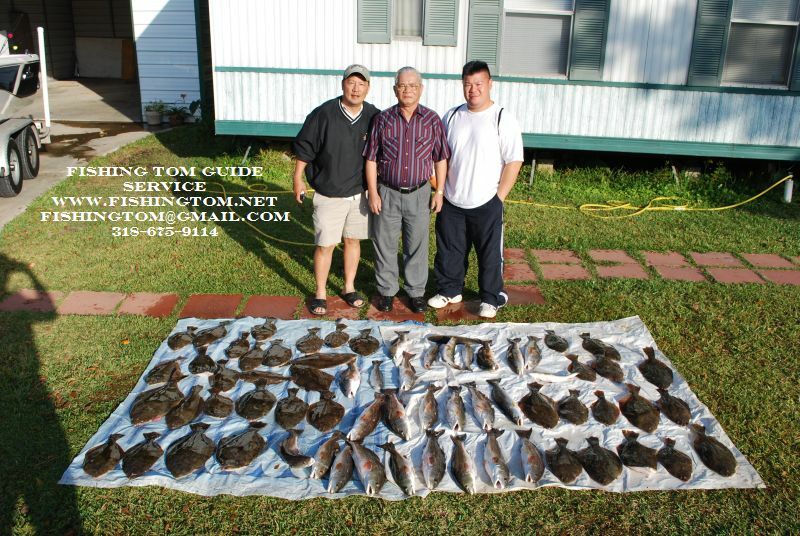 November 22, 2010 Anthony S. & Sons Christian & Conner Find the Big Bruisers on Lake Calcasieu!!!! The day started with a bang with 2 reds over 30 inches and several nice trout over 20 inches on live shrimp. Then we moved to the ship channel and put a dozen nice Flounder in the Live Well because the cooler was overflowing with Big, Big Lake Monsters. 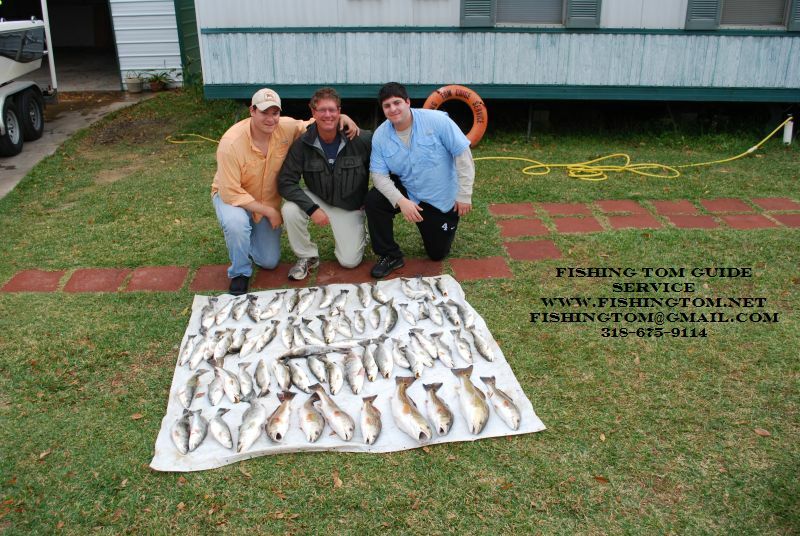 November 20, 2010 Leightom M. & Uncle Hank Slam the Big Calcasieu Trout and Reds!!! 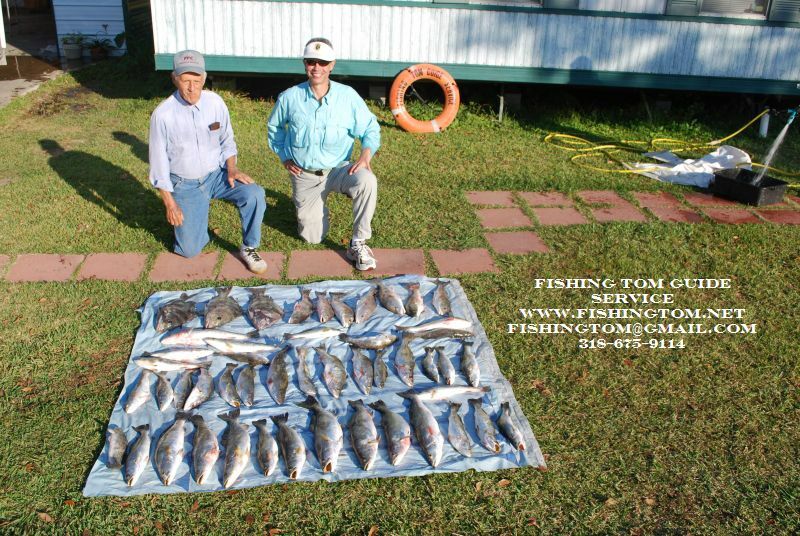 November 20, 2010 Leightom M. & Uncle Hank Slam the Big Calcasieu Trout and Reds!!! Live Calcasieu Point Shrimp was the key to an incredible limit on their 6th trip so far this year! 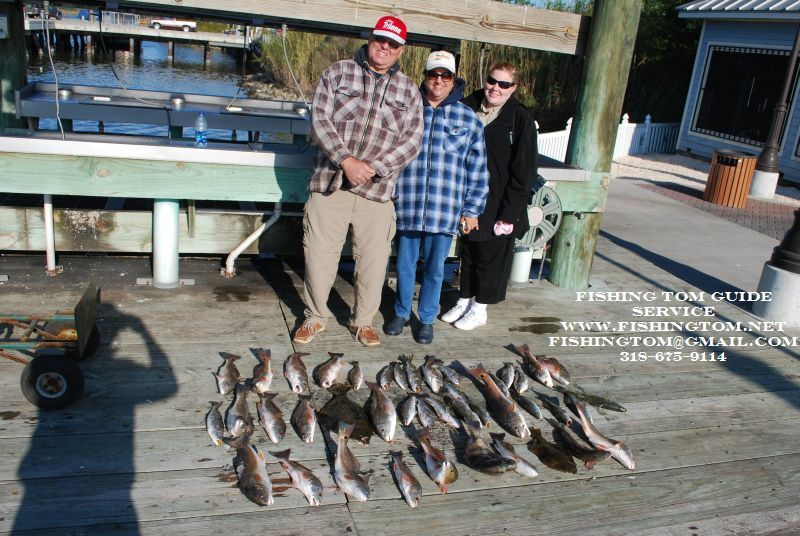 November 18, 2010 Craig H., Wife Carol, & Daughter Laura, Win Bronze at Lake Calcasieu!!! November 18, 2010 Craig H., Wife Carol, & Daughter Laura Win Bronze at Lake Calcasieu!!! The day started with a 28 mph wind and all the water in Big Lake heading for the Gulf. But with a combo of Live Calcasieu Point Shrimp and Gulp 3″ Shrimp we had a nice limit of Reds and a 4 pound Flounder by 10AM. The rest of the day we searched for the trout & after lunch the winds calmed a bit and we put 19 nice Trout in the box for a great end to a challanging day! November 17, Howard L., Mr. Tam & Daniel Wear the Flounder Out!!!! November 17, Howard L., Mr. Tam & Daniel Wear the Flounder Out!!!! We had 40 Lake Calcasieu Flatfish by 9:30 AM Then we headed North and Limited out on 20 Nice Big Lake Bronze Beauties! Plus 7 nice trout to boot and the cooler lid would not close! What a Day!